Stella Palace enjoys a privileged location in the marvelous Crete Island. In fact, the center location of this 5-star hotel enables guests to take a close look at the culture and customs of the area. 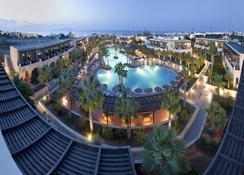 The resort is decorated in a contemporary style that is complemented by Cretan hospitality. This chic 5-star resort offers something for every traveler, which ultimately sets it apart from other hotels in the same region. The rooms in the hotel are available in plentiful categories to match the need of solo travelers, couples, families and group of friends. Whether you want to sip a wine or dine, you will find plentiful bars and restaurants within the hotels. 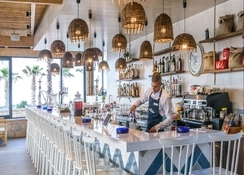 Stella Palace is conveniently situated in Analipsis Hersonissos, 700 14, Greece. It is close to numerous attractions, bars, restaurants and night clubs. The Nikos Kazantzakis International Airport is about 19.4km away from the resort, making it convenient for guests to board their flights on time. Rooms at the Stella Palace has been designed to reflect its modern and chic surroundings and are available in a variety of categories. These include family two bedroom with hot tub, superior room sea view sharing pool, family open plan pool view, Jacuzzi suites, family two-bedroom pool view, private pool suites, villa maisonette with private pool and standard room pool view. Some of the facilities in the rooms include satellite TV, safe (extra charge), direct dial phone, mini fridge, temperature controlled air conditioning, bath amenities, hair drier, laundry services (extra charge), daily housekeeping, satellite tv, wakeup call, Wi–Fi and concierge services. Stella Palace offers both buffet and a-la-carte dining options to suit a range of different tastes. 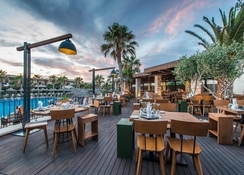 The restaurants and bars in the hotel include Poseidon Restaurant, La Veranda Restaurant, Elia Gourmet Restaurant, Main Bar, Kohili Pool Bar, Thalassa Pool Bar, Mediterra Pool Bar. 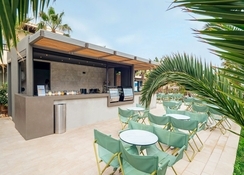 Other than this, the hotel offers various all-inclusive packages for breakfast, lunch and dinner. Stella Palace specializes in offering a vast range of sports' and entertainment options for the whole family to enjoy. The hotel offers the following facilities to guests that include water sports, trekking, horse riding, mountain biking and scuba diving. Those who want to maintain their fitness level can take advantage of the fully-fledged gym. Stella Palace also provides spaces for business meetings and social functions. 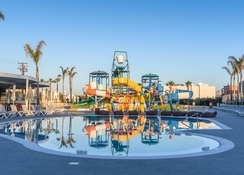 Those who want to relax by the poolside will find two swimming pools and two children’s pools. Beautiful hotel, the staff were amazing too. Had such a great time that we are going back in October and the kids are coming this time too. The Stella Palace is a great hotel which offers something for most people be it a family with children or a couple looking for some rest and relaxation. The general decor and fit/finish quality of the hotel and its surroundings are very good and the layout of the various pool areas is cleverly thought out. 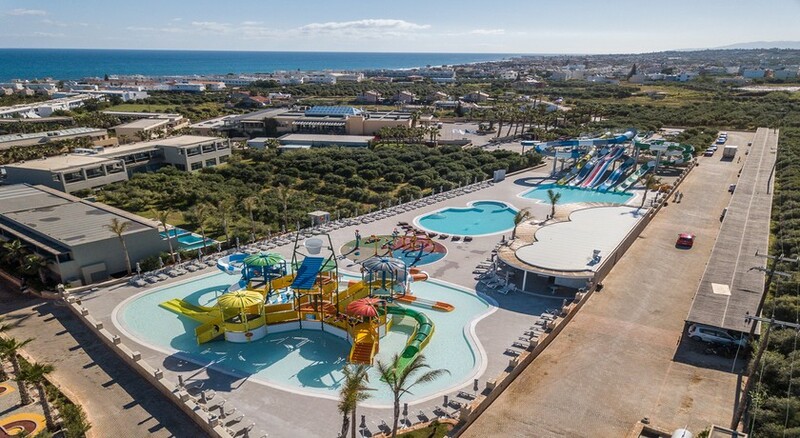 The children's pool/club is situated towards the beach end, and is therefore far away enough from the other two main pool areas so that kids can be kids and not disrupt any guests who want some peace and quiet (I traveled with my wife and 3 year old daughter so spent much of my time in the kids area). The top pool area by the main hotel building was the quietest and the middle pool houses cabana style bed areas and a swim up bar with house music playing throughout the day for a more lively atmosphere. There was a mini disco every evening at 8.30 which my 3 year old absolutely loved (shout out to Sofia in the animation team who is great with the kids). After that, there was some entertainment which was fine and included bingo night, music quiz night and Mr and Mrs Stella Palace (didn't actually witness this for myself first hand!). We were all inclusive and the food was varied with a themed night each day and a good selection of hot and cold food available. The quality was better on some nights than others but overall I was satisfied with both the choice and quality of the food. The waiting staff were very attentive and were always quick to offer you a drink upon arrival in the restaurant. They were slightly slower when you wanted a second or third though - not sure if this was on purpose or if they were genuinely too busy. We did not take up the offer of a complimentary night's dining in one of the two a la carte restaurants. I was slightly disappointed with the selection of drinks available under the "all inclusive" banner. There were only a couple of cocktails available from the menu (made with local spirits) and the beer only came in small glasses. That said, we could help ourselves to ice cream from the freezer and the snack bar in the middle of the hotel grounds offered a good selection of food, including Belgian waffles with chocolate (which were really good), hot dogs & granitas. The only other slight disappointment at the hotel was the room. I would categorise the room as 3 star+ rather than 5 star. Our room could definitely have done with some modernisation, the bathroom in particular, but that said it was spacious enough and the pool view was nice (this is a must). The hotel is situated about a 10-15 minute walk from the very small town of Analipsis. The area is still quite underdeveloped and there is only a handful of shops in the town itself and we found it to be very quiet (maybe due to the time of year we visited) so we ventured in once and didn't bother going back. Overall I would definitely recommend the Stella Palace Hotel to both families and couples and will also look to return back there in the not-so-distant future.